Hi loves! How was your weekend? I had a great time, spent some time with my oldest friend and her husband yesterday, she is pregnant and bought this ADORABLE onesie for the baby. I wanted to pet it all the time, so soft! She is due in February so it'll come in handy :-). Today I've got a gorgeous polish for you. My sweet friend Mimi creates these gorgeous frankens (seriously girl, start selling them! You can make a fortune!) and I was very happy to find some more pretties in the package she sent me. 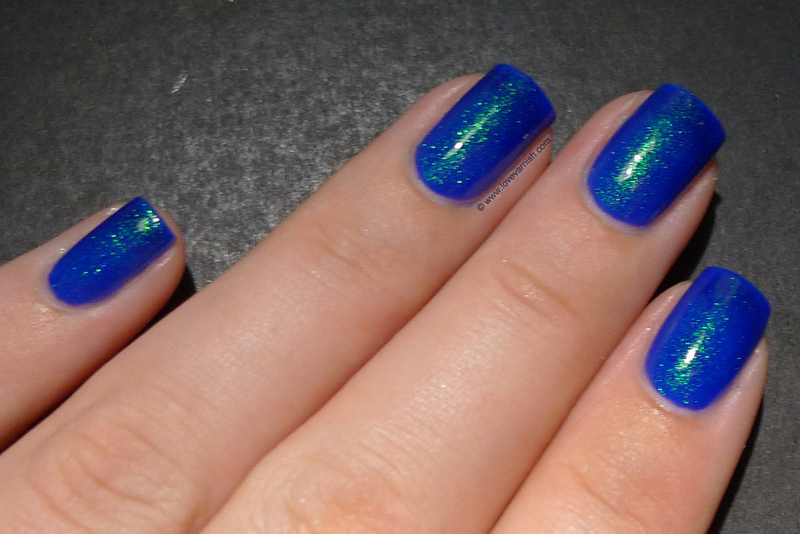 This is called Something Blue, and it is a gorgeous green/blue shimmer in a very sheer blue base. I immediately knew I wanted to layer it over a bright blue jelly to get that squishy shimmer look. I pulled out Essence Cool & The Gang (dupe to Revlon Royal) and used 2 coats. After that, I used 2 coats of Something Blue. Shimmery perfection ♥. 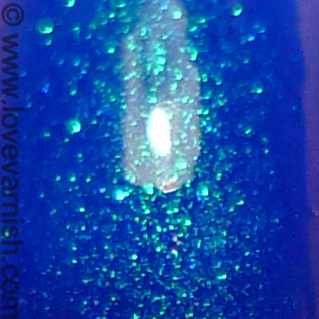 I love how the shimmer goes from blue to green depending on the angle, and it also looked so.. alive on the nail. Weird description but I think you know what I mean - it just has so much depth! It also applied like butter, not too thin but spreading by itself. Perfect. Do you like shimmers like these? And what would you layer it over? A darker blue perhaps? I might try that in the future! Ahhhh, this is a stunning combination! It looks so amazing and vibrant! Sell them Mimi!!! Everytime I see her post one or someone else post one I want to shout SELL THEM! I've not seen one I don't love! Yeah! Maybe if we shout hard enough she'll listen ;-)? @MakeupWithdrawal sell them please ♥! Oh my gosh!! This is amazing!! Mimi, listen and sell them!! LOL. Love this on you Deborah! And that onesie is too cute! Thanks Marisa, it is gorgeous right?! And yeah so adorable ♥. Out of curiosity, did this Essence polish get weird after sitting around for any length of time? I have the Revlon and the "blue" kind of settled to the bottom in a VERY thick paste, I had to use an orangewood stick to stir it because shaking wouldn't mix it. I was very disappointed and I'm looking for a replacement because it's such a gorgeous color! It isn't unusable, but yes, the blue pigment tends to settle. I have to shake this real good, let it rest a bit and then shake some more to get a nice looking polish.